Banana Yeast Bread is a totally different way to think about “banana bread”. 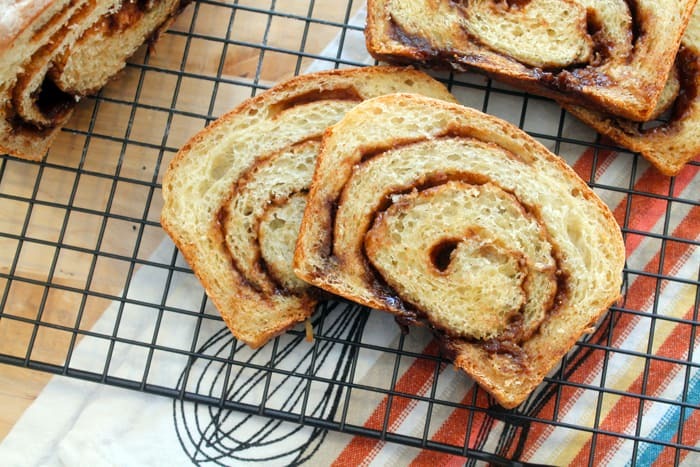 With a cinnamon brown sugar swirl, you may never go back to quick bread again. Call me crazy, but I’m kind of over banana bread. I mean, I’ve made Strawberry Banana Bread, and Maple Cranberry Banana Bread, and even used coconut oil to switch up the standard banana muffin. I feel like there’s only so many times you can look at the black bananas on the counter (how does that keep happening? 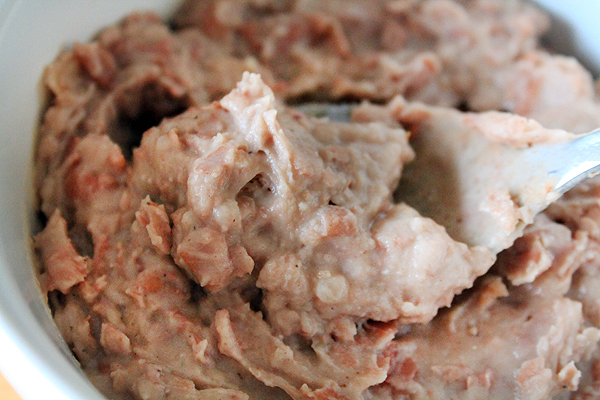 ), whip up a quick bread, and actually have people eat it. If I’m honest, I think James and his coworkers are quite over banana quick bread in its many forms too. The truth is, this post has been two weeks in the making. Four attempts at bread-making, three of which failed spectacularly. Why do I tell you this? Not to scare you away from yeast, that’s for sure. Rather to point out a part of bread-making that may be often overlooked – you need to make sure the recipe you’re attempting to make is appropriate for the size of pan you have. 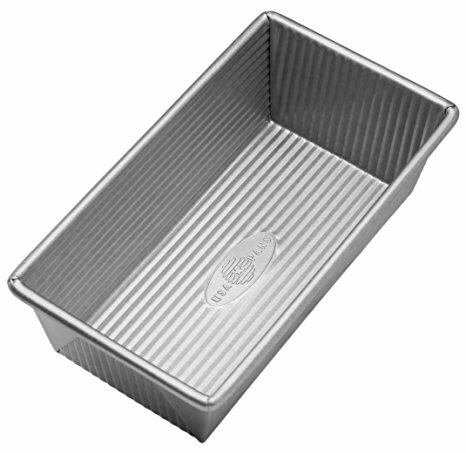 I didn’t think an extra inch in pan size could really make a difference, but I’m here to tell you, friends, that if the recipe says you need an 8×4 inch loaf pan, that’s what you need. This particular recipe, for Banana Yeast Bread, uses a 9×5 inch loaf pan, which seems to be the standard for most commercially sold bread pans. Now let’s talk about this swirly, sweet, golden-brown loaf of bread for a minute. At first glance, it’s quite unassuming. Sure, there’s a pretty curlicue of cinnamon brown sugar. But until you taste this bread, you aren’t expecting the flavors that pop. On day one, I will admit, this bread did not taste overly of bananas to me. Just a sweet yeasted bread with a hit of cinnamon and sugar that toasts like that’s the only reason you made it (which, let’s face it, I did). On day two, hello bananas! I’m here to tell you, if you didn’t already know, that bananas and cinnamon are a match made in heaven. Toasted to perfection, slathered in creamy butter with just a little salt. Good golly, breakfast is my favorite meal of the day for a reason. The Brit gives this bread two thumbs up, especially when toasted. I’ll say it again – this a loaf of bread that you make specifically for toasting. It’s okay un-toasted, but reaches award-winning breakfast heights if you let it get all crunchy-chewy-golden-gorgeous. I didn’t find the actual recipe any harder to make than a quick bread because I let my stand mixer do the kneading for me. The only thing you’ll have to do differently is let it rise, and that’s a totally hands-off experience anyway. Now about that toaster – it seems a little silly, but watching toast brown is actually really fun. Getting to that just right point of golden-ness is something that makes me really happy. Funny story about toast involving my sister-in-law, Sophie: Twelve years my junior, Soph is most definitely the baby of the entire family (not counting Evan), and is very particular about her toast. Or as James and I like to call it, warm bread. Anything past the slightest tinge of gold and Sophie considers the bread burnt and starts again. 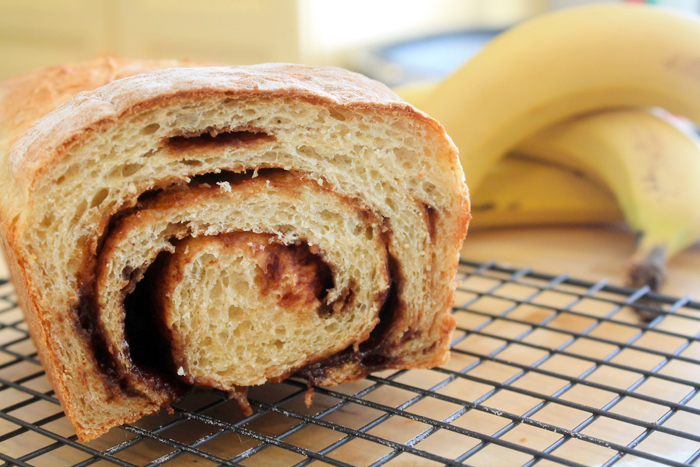 Banana Yeast Bread is a totally different way to think about banana bread. 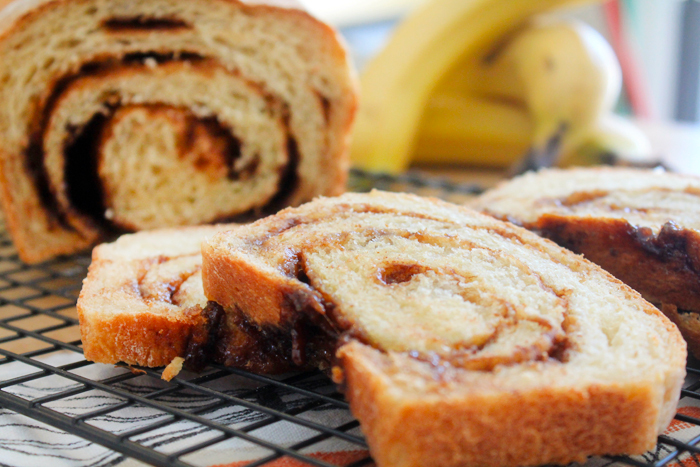 With a cinnamon nutmeg sugar swirl, you may never go back to quick bread again! Mix bread flour and kosher salt together in a medium sized bowl, whisking to combine and aerate. 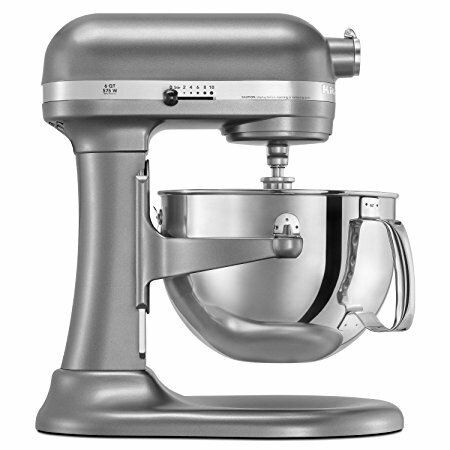 In the bowl of a stand mixer, combine water, yeast, and pinch of sugar. Leave it to sit for a moment, so that the yeast can start to eat the sugar. When frothy, add the rest of the sugar, yogurt, mashed bananas, and vanilla. Mix well using the dough hook. Add the flour mixture to the wet ingredients and continue to mix with the dough hook on low speed until the sides of the bowl are clean, and the dough begins to be elastic. Add the canola oil and continue mixing until the dough turns silky smooth. Spray a separate bowl with cooking spray. Form the dough into a ball and place it into the bowl. Cover the bowl with plastic wrap, pressing the wrap down around the dough ball. When the dough is ready, combine brown sugar, cinnamon, and nutmeg together in a bowl, whisking together so the spices are well distributed. Spray a bread loaf pan with cooking spray that has flour in it, coating well. Flour your work surface, then knead the dough for about 5-8 minutes, until the dough is soft and supple. Work the dough slowly, or it will be tough. Use a rolling pin to roll out the dough into a flat rectangle, about 9x12 inches. Spread the brown sugar mixture over the rectangle, leaving 2-3 inches sugar free at the edge of the dough. Roll the dough, jelly roll style, from the shorter end of the dough. Pinch to seal the ends and seam. Put the dough in the loaf pan. Cover it with the same plastic wrap, and allow to rise until doubled, about half an hour to 45 minutes. Preheat the oven to 325°F about 10 minutes before dough is fully risen. Remove the plastic wrap and bake for 35-40 minutes, until the bread is golden brown. Allow to cool for about 10 minutes in the loaf pan, then remove and let cool completely on a wire rack before attempting to cut. I love toast! It is hard to pick one favorite but homemade sourdough toast is always a favorite. I suppose it all depends on the morning, but english muffins and bagels are a good option any morning. How cool is that!!!!! My favorite is sourdough – all the time. My favorite bread to toast is a nce raisin bread. I like slathering it with reall butter and adding cinnamon sugar! English muffin toasting bread is my favorite. Anything, but just love it with butter! English muffin bread makes me the happiest! Bagel is my favorite to toast. My favorite is bread to toast is cinnamon bread. Also love banana bread. Favorite bread to toast? Is that like asking me who my favorite beagle is? I just love bread and carbs. And when it’s toasted, it’s even better!